This defines how the object moves into the scene towards its target position. This is how the object moves within the scene after performing its Intro. This is how the object moves out of the scene should you want it to. The 'Motion' ribbon category gives quick access to how the object is animated. 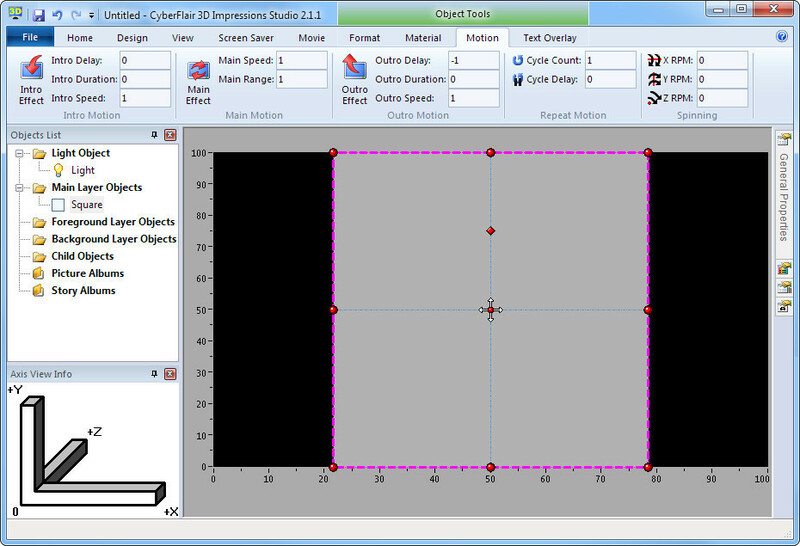 Selecting the 'Motion Properties' tool window also gives you access to all values that affect an object's motion. The object's Motion Property values allow you to define how and when the object moves around the scene. Right-clicking the selected object displays the context menu that also offers access to 'Motion Effects'. The position that you place objects within the editor is what is called its target position. This is the position that any Intro Motion will finish at. This determines the number of seconds delay before the object makes its first appearance. This specifies the style of motion the object performs in reaching its target position. This determines how many seconds the intro motion is performed for. This determines how fast the intro motion is performed. The 'Edit...' from the drop-down select control available by clicking the 'Intro Effect' property. 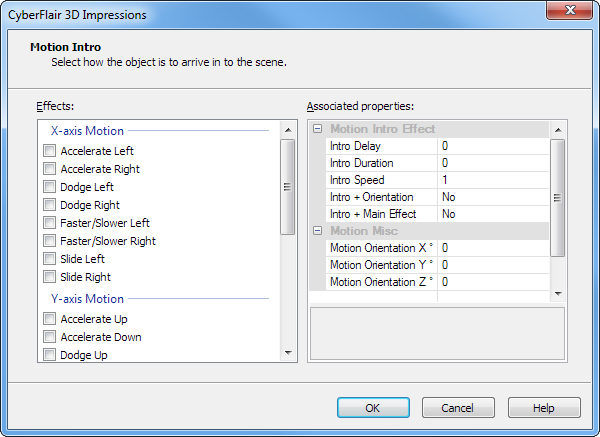 The 'Motion Effects > Motion Intro...' from the object's right-click context menu. For this tutorial, we will make the object reach its target position by flying towards the viewer. Where the list of Effects: are shown scroll down and select 'Slide Nearer'. You should see the white square starting a little way in the distance, moving toward you for 2 seconds and stopping at its target position. Now try changing the Intro Speed to 4. When you preview the scene, the object now starts further away. Actually it is starting at 4 times the previous distance. With the new Intro Speed of 4, now double the duration to 4 seconds. When you preview the scene, the object now starts even further away. Actually it is starting at another double the distance above and 8 times the original distance. If you want a pause, before an object makes its appearance, simply enter the number of seconds for the 'Intro Delay' property. Now try experimenting with different effect styles. For more information on Intro Motion effects and properties, see 'Motion Effects' help topic. This determines the number of seconds delay from after the Intro Motion completed before the object starts to leave. This specifies the style of motion the object performs in leaving the scene. This determines how many seconds the outro motion is performed for. This determines how fast the outro motion is performed. This determines the total number of times the 3 stages of motion are performed. The 'Outro Motion' button on the 'Format' context ribbon. The 'Edit...' from the drop-down select control available by clicking the 'Outro Effect' property. 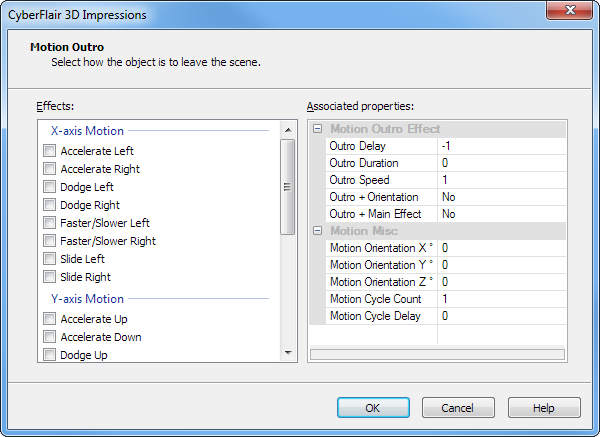 The 'Motion Effects > Motion Outro...' from the object's right-click context menu. For this tutorial, we will make the object leave by flying away from the viewer. Where the list of Effects: are shown scroll down and select 'Slide Further'. You should see the white square perform your previously selected Intro, pause for 2 seconds and then spend 4 seconds moving further away and then disappears. If you did want the motion to repeat, simply increase the number for the 'Motion Cycle Count' property. Also, if you'd like a pause between cycles, specify the number of seconds delay for the 'Motion Cycle Delay' property. It's worth noting here that when motion is repeated, the original Intro Delay is only applied once before motion starts. So it's only the Motion Cycle Delay that determines the delay between repeats. Now try experimenting with different effect styles. For more information on Outro Motion effects and properties, see 'Motion Effects' help topic.